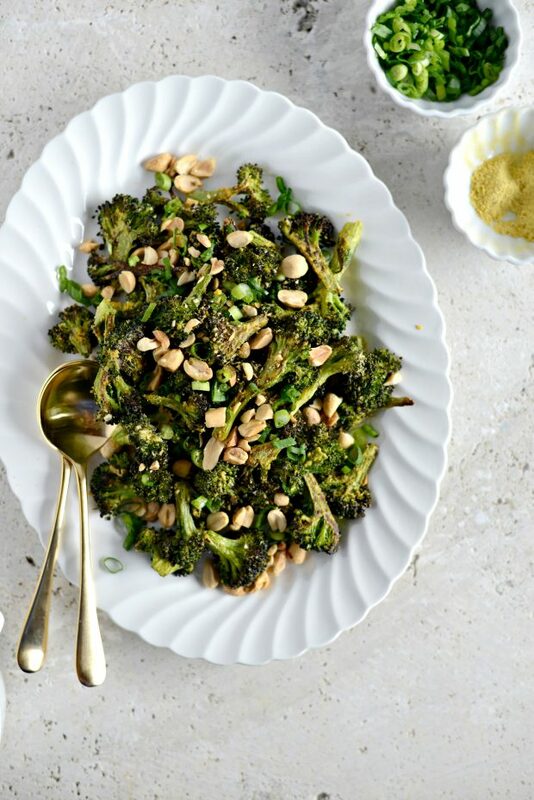 This roasted broccoli with peanuts is a light flavorful side dish that works with just about any main protein. My favorite is to serve it with salmon! I do not do well with change. I openly acknowledge this about myself. Yet every spring I get thrown off kilter when my girls softball season starts–which was technically last week. Haileigh made varsity, Malloree is starting her fast-pitch spring season and being in two places at once is a little tricky. So I apologize for my lack of posts last week, I was driving to here and there and sitting in double headers and when the day was done I’d face-plant my pillow and saw logs. I’m still trying to acclimate to my new schedule, but hopefully this week runs a little smoother and I can get back in the groove of things. 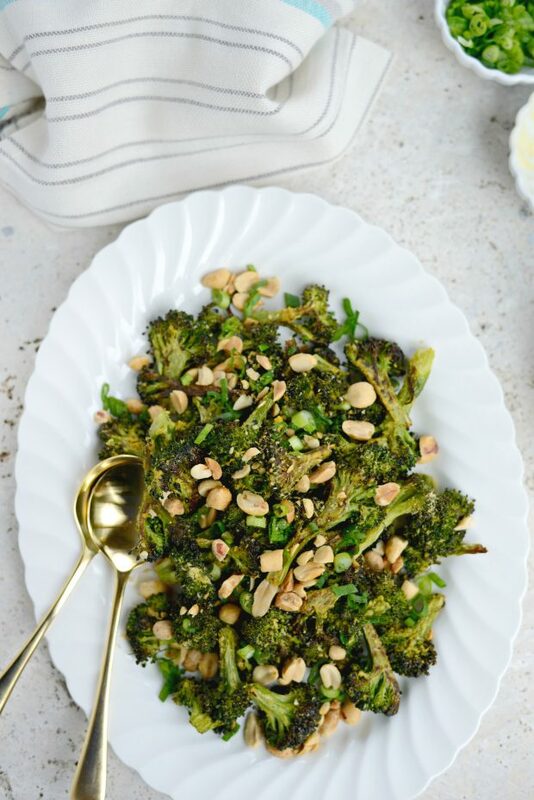 For those who like me and have a crazy busy schedule, this roasted broccoli side dish (which could be a main dish if you wanted it to be– it was my lunch) is a delicious no-brainer and I welcome it with open arms. The fewer the ingredients the better amiright? 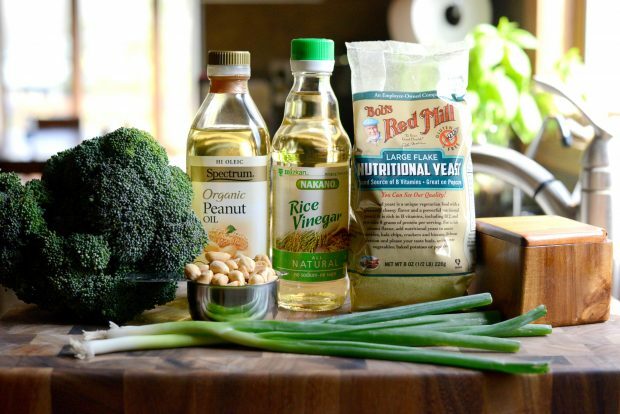 For this you’ll need one large head of broccoli, peanut oil, rice vinegar, nutritional yeast (more on this later in the post), salt, lightly salted peanuts (chopped) and green onions. 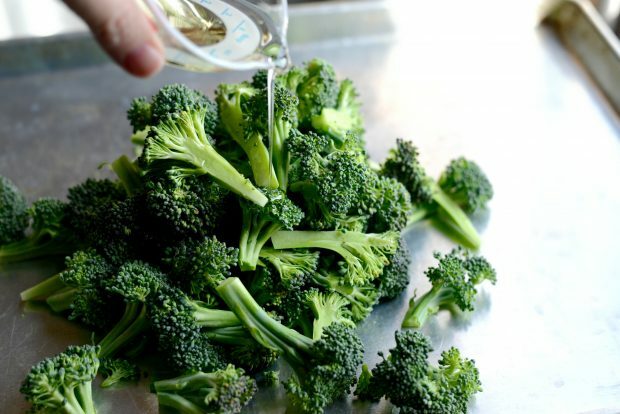 I always buy organic broccoli. I noticed the stems to be more tender than non-organic, so I leave more of it attached to the floret because I know they will roast evenly and easily in a super hot oven. 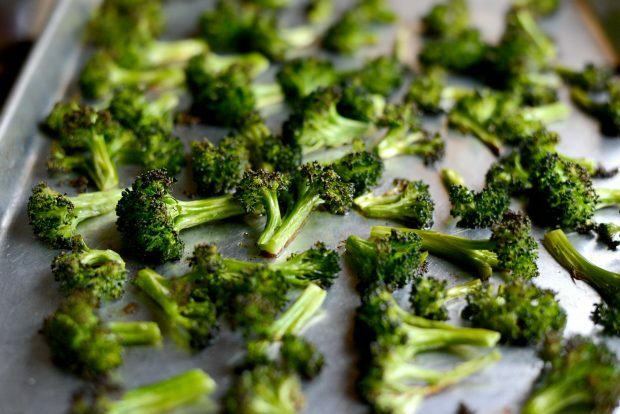 …then spread the well oiled broccoli out on to a metal baking sheet and slide into a preheated 500 degree oven for 8 to 10 minutes. Meanwhile measure out 1-1/2 tablespoons of nutritional yeast. This stuff is amazing!! 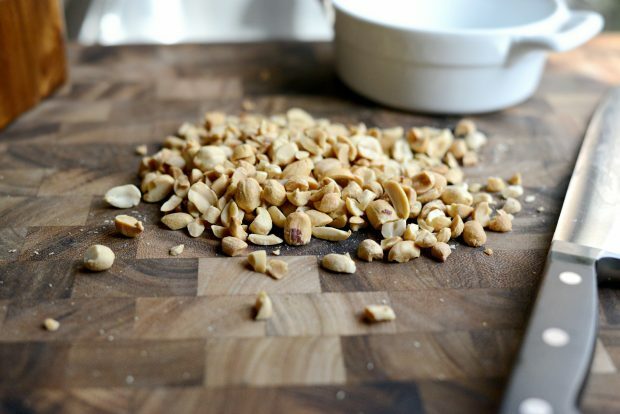 I love it in this recipe because it adds this nutty and cheesy flavor (all the while being dairy free!) 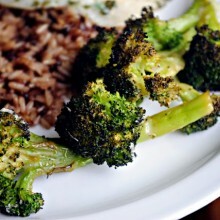 that adds so much flavor to the broccoli. Oh and it’s also delicious on popcorn! 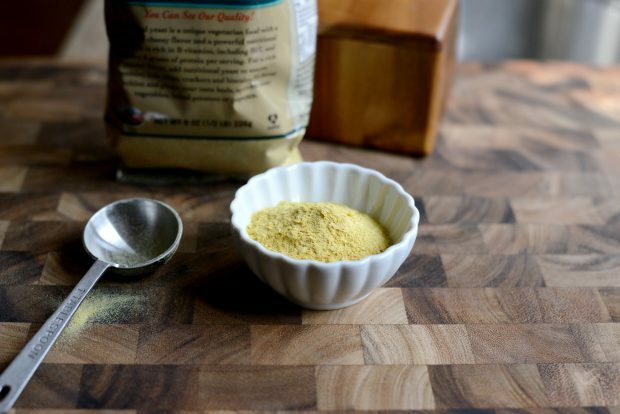 Read more about nutritional yeast here. 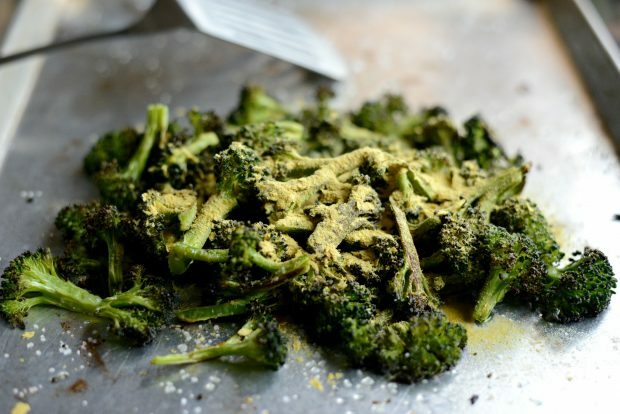 …and then sprinkle on the nutritional yeast. 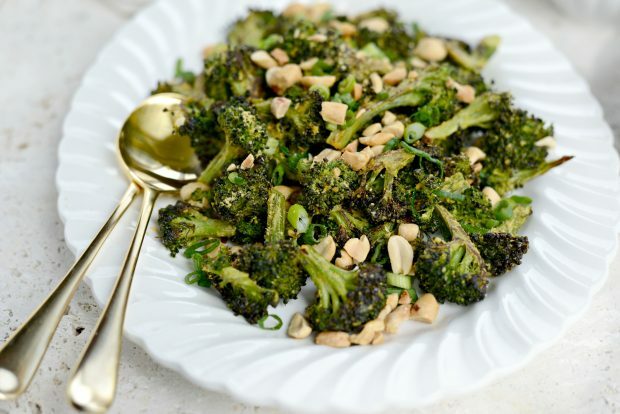 Then just serve sprinkling the broccoli with chopped peanuts and green onions. The flavor combo is outstanding! 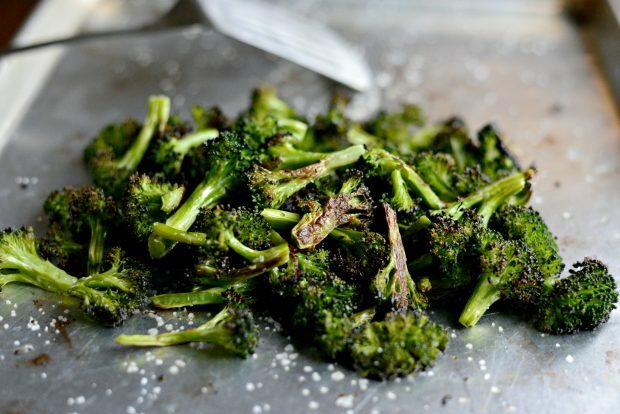 My family is a huge roasted broccoli fans. And although I ate ALL OF THIS- #sorrynotsorry– and didn’t save any for them, I think they’ll love it too! 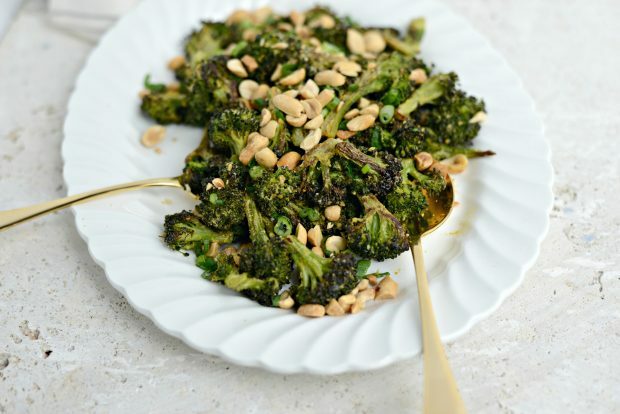 Crispy broccoli tossed with nutritional yeast (for a cheesy nutty flavor), peanuts and green onions. 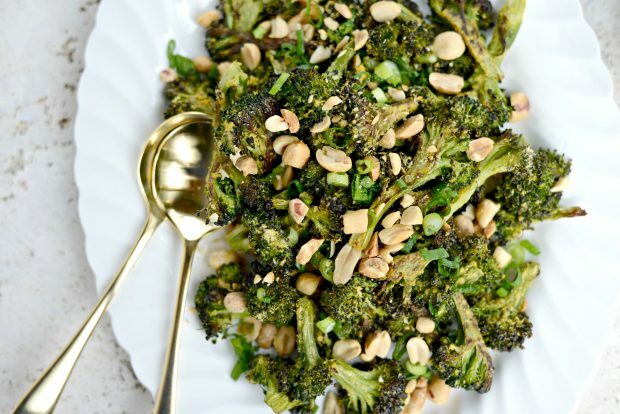 A super easy and delicious side dish or main dish for one or two! 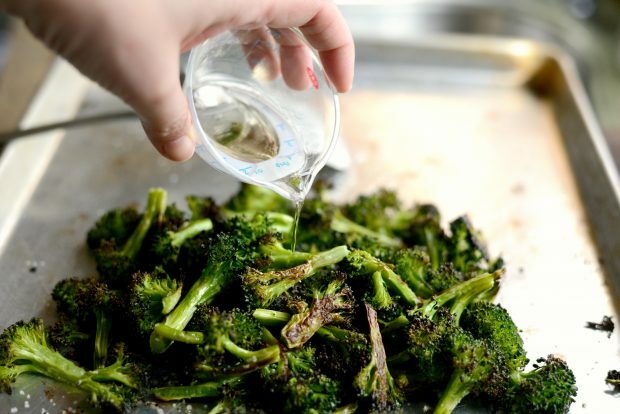 On a rimmed, metal baking sheet toss broccoli florets with peanut oil and then spread into an even layer. 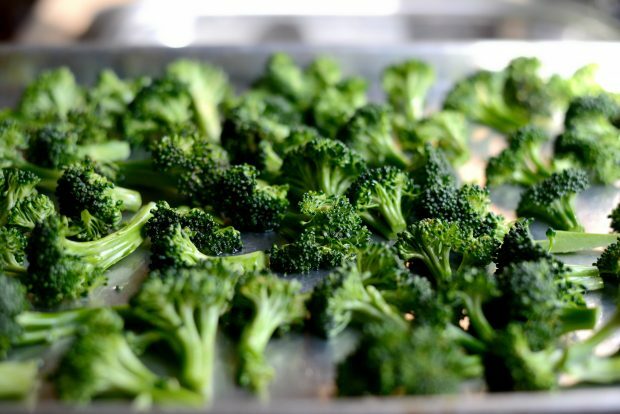 Roast the broccoli for 8-10 minutes, rotating the pan half way during roasting. 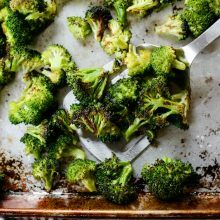 Once the broccoli tops are crispy and the underneath is caramelized, sprinkle with kosher salt and toss into a small pile. 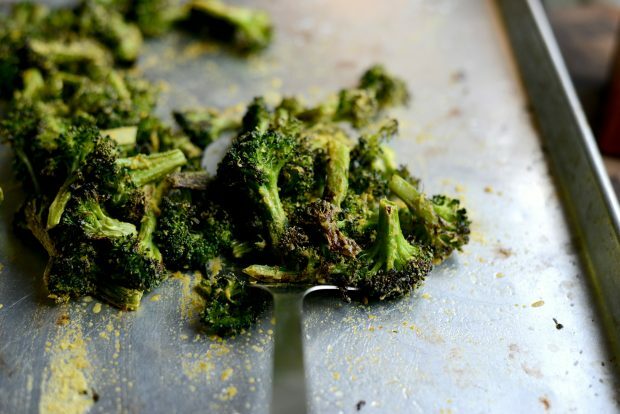 Drizzle with the vinegar and sprinkle with the nutritional yeast. Toss together until coated evenly. 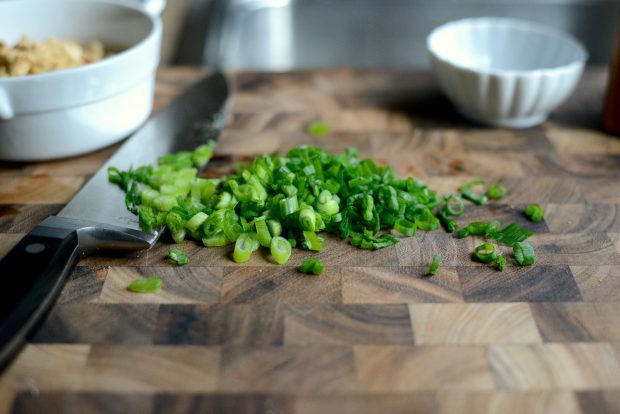 Serve with chopped peanuts and sliced green onions. 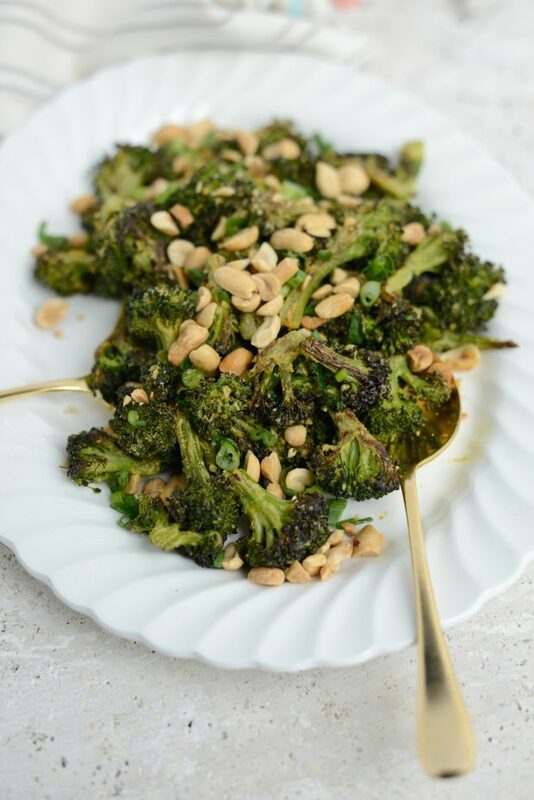 New here and must say – I love broccoli and this recipe looks like a real winner. Will be trying this week. Kind of stumbled over your girl’s names. Wow just um uh wow. Adjusting to change is always hard! 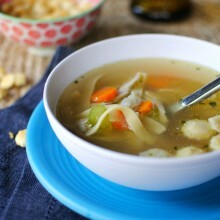 This looks nutritious and yummy! I have never cooked nutritional yeast before. I’ll have to try it out.